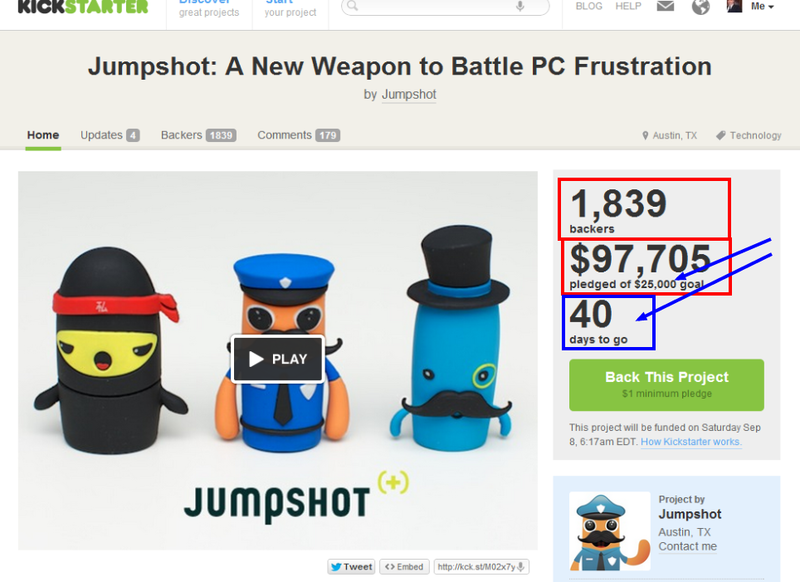 CrowdFunding success, still time to invest : Jumpshot: A New Weapon to Battle PC Frustration ! Pitch it to me quick...Jumpshot is a fully automated solution for solving PC frustration. Launch our app and enjoy an elegant interface and secure web surfing while we work our magic in the background. David Endler and Pedram Amini, two longtime Austin friends and computer security experts, wanted some early feedback on a software product called Jumpshot that they will soon launch. So they are taking it for a marketing test drive. So far, so good. Two weeks into its introduction on Kickstarter, Jumpshot has received commitments from more than 1,600 online supporters to back the startup with nearly $88,000. That is far more than Endler and Amini were expecting.Endler and Amini chose Kickstarter.com, a website that promotes the early "crowd funding" of creative projects, and held their breath about what the reaction would be. After Kickstarter takes its 5 percent cut of the money raised, Endler and Amini will use the funds on product tweaks. They expect their self-funded company will hire a few workers, make some tweaks and add features to the software and buy computer cloud space to handle customer access to the company website. The Kickstarter backers don't get stock in the company. Instead they get early access to the software as well as swag that includes T-shirts, stickers and temporary tattoos — plus memory sticks that contain the software and are shaped like small characters the company created and calls "minions." Early supporters also will be honored with their names listed on the young company's website. They will be a sounding board as the company considers future product features. The company, also named Jumpshot for its software, wanted the support and feedback from early customers to help shape the product and to act as marketing advocates. "We are trying to get the word out," Endler said. "The more backers and supporters and early users we have, the better the product will be. We get these amazing early adopters who will help shape the future of our offering. We get to validate some ideas ahead of time." Endler and Amini had worked together at a couple of network security startups, including Austin's TippingPoint Technologies Inc., which was sold in 2005 to 3Com Corp. for $442 million. Later, 3Com was bought by computer giant Hewlett-Packard Co.
Endler and Amini talked about doing a startup together and "threw around a bunch of ideas." "We kept coming back to family and friends," Endler said. They knew from experience that consumers with personal computer problems typically draft a friend to fix it for them. Both of them had spent far too many hours fixing friends' PCs that were clogged with malware and other ailments. "We figured out that typically there is a family CTO (chief technology officer) who gets called on regularly by five to 10 friends to fix their PC problems," Endler said. "We identified with that person. We wanted to help that person." The two decided to create software to help "that person" easily fix PCs that are bogged down with viruses, malware and other ailments that affect performance. When it becomes generally available, the software will be available on a PC memory stick or by downloading it online. The software is designed differently than many computer security applications. It runs on a custom Linux software environment and is designed to spring into action when the computer is rebooted and while the Windows operating system remains "sedated." Endler said that gives Jumpshot a better chance to sleuth out problems on the computer's hard drive that would be difficult to find if Windows were running. And the basic software will connect via the Internet to the company's cloud computing operation to get access to its latest updates. The two wanted the Jumpshot user experience to be easy and even fun. So they worked with an Austin design firm, Thirteen23, that helped them create a user interface and a series of characters they call "minions" that are in charge of various security tasks. "Officer Pete" is the lead minion, and his trusty crew of helpers includes "Kobayashi," a ninja minion, that "kills viruses, Trojans, scamware, spyware and other evils." Other minions include "Sir Jeffrey," "Dale Jumpshot Jr.," "Nikita," "Holmes," "Mario," "Dr. Liza" and "Zilch." Another Austin company, the Delivery Men, put together an online video that explains the advantages of Jumpshot. "We understand that design is really important," Endler said. "We are focused on having a fantastic looking product and having it work better than anything else out there." The company has three patents pending. Endler expects to formally launch the product toward the end of this year. The two founders say they expect to talk with PC makers, retailers and other potential partners about marketing Jumpshot. Kip McClanahan, former CEO of TippingPoint, said he is impressed with what his former employees have done so far. These days McClanahan is a partner at the Silverton Partners venture firm in Austin and works extensively with tech startups. Endler and Amini "are the real deal when it comes to security technology, and they are now in the process of proving themselves to be the real deal when it comes to the entrepreneurial startup world," McClanahan said. "I want to talk to them as soon as they have something to show an investor."